AT TIMES ALBIA’S defense swarmed Mid-Prairie’s Schwartz, but more times than not, Schwartz ran through Albia’s defense. It was a disappointing end to a pretty darned good season. 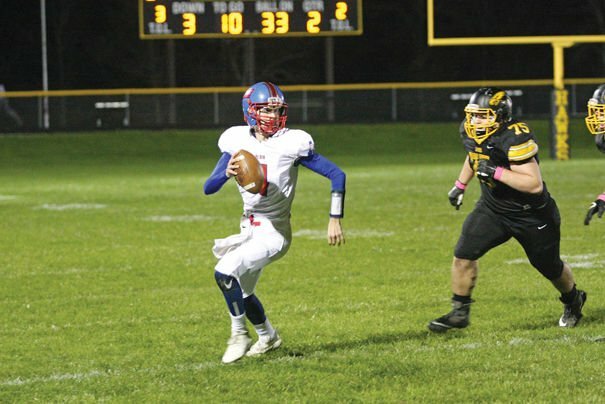 Albia’s defense that seemed to improve every game until week eight, gave up 41 against playoff bound Williamsburg. That was not a big surprise. But giving up 48 to 2-6 Mid-Prairie was surprising. So was yielding 496 yards of total offense in a 48-20 season-ending loss. Two Mid-Prairie running backs had 100+ rushing games, including a brilliant 34-carry, 200 yard game by Justin Schwartz and a nine-carry, 108-yard game by Grant Boyse. Albia’s defense also gave up as much passing yardage as they have to any team this season. 5’7”, 155-pound Brad Torrow completed seven of 13 passes fort 155 yards, including two passes for 115 yards and a touchdown to Boyse and two to 6’5” Tom Butters for 44 yards. Little mistakes turned the game quickly. Albia had a pass interference call in Mid-Prairie’s first possession, which brought the ball to the 48, but a dropped pass in the endzone and another completion forced a punt. Albia started at the eight and went to its stacked I formation, running Jer McAninch twice for 11 yards and a first down and then Blake Chance hit Gage Wilson for a 15-yard gain, but a holding penalthy brought the ball back to the 10. A dropped pass on a third and 19, 25 yards upfield forced a punt. Mid-Prairie started at the Albia 35, Schwartz gained 13, 18 to the one and scored with 5:37 left. The kick was good and Albia trailed 7-0. Starting at the 28, Chance hit Nathan Crall for five, but another dropped pass forced another punt with 4:49 left in the quarter. Starting at their own 36, Boyse gained 11 to the 47, then sprinted virtually untouched for a 47-yard touchdown. The kick made it 14-0. The Blue Demons gathered themselves starting at the 26 and Chance hit Crall for four, Beau Leshen for five and McAninch earned the first down at the 38. On the next play Albia was called again for holding. Leshen caught another Chance pass for 10, but Albia punted again. Albia could not figure out how to stop Schwartz, when Albia’s defensive ends forced him inside, the tackles and linebackers weren’t there quick enough. If he got around end, he gain a half dozen yards. Mid-Prairie drove to the Albia 46, but Leshen sacked Tornow back to the 39. Then a great rush had Tornow all but sacked, but he flipped the ball to Boyse to ran 41 yards to the 19. From there Schwartz ran 16 to t he three and scored with 9:02 left in the half to make it 21-0. 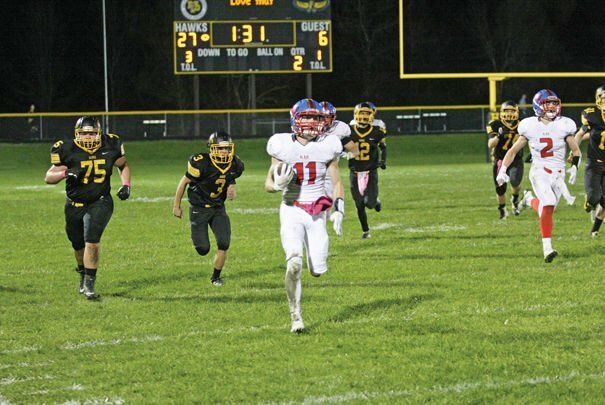 Albia came out with their empty backfield and on third and 10 at the 35, Chance hit Crall for 14, hit Dawson Hermsen for seven and after a four-yard loss on a slip, Chance found Crall and the senior went right up the middle of the field for a touchdown. The kick clunked off the crossbar, but Albia was on the scoreboard, trailing 21-6. The defense Blue Demon Nation was used to seeing dropped Mid-Prairie for a 12-yard loss and forced a punt with 4:30 left in the half. After the punt Albia had the ball at the 20 and Chance threw to Hermsen who ran 47 yards to the Golden Hawk 33. After a nine-yard Chance run, Albia faced fourth and one and McAninch came up short. Mid-Prairie took over at the 24 and on third and seven, Mornow found Boyse who ran 73 yards for the touchdown. The kick failed and Albia trailed 27-6 with 1:26 left in the half. But Crall gave the Blue Demons life just before the half, running back the kickoff 82 yards for the score. Wilson’s kick was short and Albia trailed 27-12. Mid-Prairie wasn’t done and moved quickly upfield behind the passing of Mornow, but Wilson stepped in front of a Golden Hawk receiver, intercepting with 32 seconds left. There was reason for hope for Albia as Mid-Prairie lined up to kickoff, but an onside kick was recovered by the kicker, Schwartz rushed six times from the 46 and Mid-Prairie held a 33-12 lead with 10:14 left in the third quarter. Albia took over at the 20 and Nate Crall established a new season record for most catches with a 10-yard pass from Crall. Wilson caught a 12-yard pass to the 42, but two incompletions led to another Albia punt. Wilson intercepted three plays later and Albia had the ball at the 24. Albia tried running, lost nine yards, went nowhere on a horse collar call one way and an unsportsmanlike penalty on Albia’s sideline, but then Chance threw deep to Leshen, who seemed to stand in the endzone for a lifetime before the ball settled into his arms. A pass from Chance to Crall, Albia had cut the lead to 13, 33-20. The game got a little chippy and Albia was called for another unsportsmanlike penalty on the kickoff, giving Mid-Prairie the ball at the 48. Schwartz looked like a Heisman candidate, rushing seven times, scoring from the three and the Golden Hawks were back in the lead 41-20. Hermsen caught a 17-yard pass on the next drive, but Albia punted just before the third quarter ended. Schwartz rushed six straight times for two first downs, Boyse picked up 12 and Albia’s defense held to force a punt. Starting at the 17, gains of eight on a pass to Hermsen and 10 to a pass to Wilson ended in futility when Wilson fumbled trying to get extra yards. Jaron Utzinger was now in at running back and he gained one, 21 to the 13 and scored with 5:00 left in the game to make it 48-20. Albia moved to the Mid-Prairie 30 behind three passes Chance to Crall, but what looked like a possible big gain on a pass to Crall fell a yard short of converting the fourth down when Crall slipped. Senior Skyler Workman caught a pass which ended Albia’s final drive.